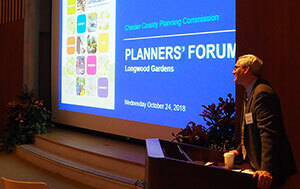 About 50 professional planners and municipal officials from the local area recently attended the Chester County Planning Commission’s fall 2018 Planners’ Forum to learn about current issues, including long-term planning at Longwood Gardens, understanding the Certified Local Government Program for historic preservation, and wayfinding signage for Chester County. The Planning Commission conducts these forums twice a year at different locations in Chester County. The October 24th event took place at Longwood Gardens, a botanical garden in Kennett Square. Brian O’Leary, executive director at the Planning Commission, provided an overview of Landscapes3, the county’s next long-range comprehensive plan. The plan will balance preservation and growth across the county’s landscapes through six goal areas: Preserve, Protect, Appreciate, Live, Prosper, and Connect. The Chester County Commissioners will conduct a public hearing to consider adoption of the plan at 7 p.m. November 29th at Uptown! Knauer Performing Arts Center, 226 N. High St., West Chester. Learn more about Landscapes3. “The planning process never stops,” Redman said. Longwood has about 65,000 household members and about 1.5 million visitors at every year, making it the most visited public garden in America, according to Redman. Learn more about Longwood. Cory Kegerise, community preservation coordinator for the Eastern region of the Pennsylvania Historical and Museum Commission (PHMC) State Historic Preservation Office, provided guidance on the Certified Local Government (CLG) Program for historic preservation. Kegerise said the program was designed to recognize and support holistic preservation efforts at the local level. Any Chester County municipalities that are interested in applying for the CLG grant should submit an application by 4 p.m. November 2. Learn more. Susan Hamley, executive director at the Chester County Conference & Visitors Bureau, said there is a plan to replace the wayfinding signage throughout the county. She noted that community wayfinding creates “repeat visitation” by increasing awareness of the depth of destinations. She said signs are marketing tools that can extend a person’s visit. Hamley explained that current signage in the area is noncompliant; there are issues with reflectivity, typeface, and copy height. There also is too much clutter and some signs aren’t even visible, she said. The bureau has worked with a company to design the new signs, which will be colored merlot and gold, and has coordinated with some counties in Delaware for landmarks near the state lines. The bureau is now attempting to secure state funding to assist with the costs before moving forward, she said. Hamley noted that tourism is an economic development tool. Travelers spent about $772.6 million in Chester County in 2016, which generated 7,500 tourism jobs, according to “The Economic Impact of Travel and Tourism in Pennsylvania,” a 2016 Tourism Economics report. Learn more about the bureau.